Dapsone and clofazimine is a known therapeutically effective combination against various Mycobacterium species. However, anti-tubercular effect of this combination is limited due to the low aqueous solubility of clofazimine and production of toxic metabolites after first pass metabolism of dapsone following oral route of administration. Therefore, the aim of this investigation was to develop poly-(lactide-co-glycolic acid) nanoparticles (DCNPS) of dapsone and clofazimine. Nanoparticles were prepared using emulsion solvent evaporation method. Developed DCNPSs were characterized for particle size, zeta potential (Zp), morphology and in vitro release. Positively charged (Zp 27.4 mV) DCNPSs with uniform spherical shape depicted controlled release of dapsone (82%) and clofazimine (68%) after 24h. DCNPS showed significantly improved in vivo efficacy against Mycobacterium tuberculosis H37Rv strain infected small animal model than that of drug solution (DCS) as bacterial loads in the lungs (Log10 of CFU/g) was reduced to 2.7 ± 0.34 (DCNPS) and 4.9 ± 0.21 (DCS) from 6.8 ± 0.23 (diseased control). In vitro therapeutic doses of dapsone and clofazimine in both DCS and DCNPS were found to be very safe to use following intravenous route of administration. DCNPS offered an effective mean of introducing safe delivery of dapsone and clofazimine systemically with enhanced in vivo efficacy against H37Rv strain of Mycobacterium tuberculosis. Dapsone, Clofazimine, Nanoparticle, Tuberculosis, Chitosan, PLGA. Tuberculosis (TB), is caused by Mycobacterium tuberculosis, is the important global health problem and it is the second most leading cause of death from infectious diseases worldwide . According to World Health Organization (WHO), about 9 million people who suffered from TB died worldwide in 2013 and most of the estimated number of cases occurred in Asian (56%) and African Region (29%). Despite India and China alone accounted for 24% and 11% of the total cases in 2013 respectively . TB is normally transmitted through a person with infectious pulmonary TB to others by droplet nuclei, which are aerosolized by coughing, sneezing and speaking. M. tuberculosis bacteria usually enter into the pulmonary alveolus via aerosol delivery of particle size 2-5 μm [2,3]. Most of the TB cases can be treated easily with short term medical therapy. Second-line drugs used in the treatment of TB are characterized by their low efficacy and high toxicity . Clofazimine is a phenazine dye used for the treatment of tuberculosis (TB) due to its potential activity against M. tuberculosis. It shows good In vitro and In vivo activity against drug-resistant strains of M. tuberculosis . Dapsone, a chemotherapeutic agent, is mainly used in the treatment of leprosy, pneumonia and malaria . Dapsone has been reported to be effective against different Mycobacterium strains like M. avium, M. intracellulare, M. kansasii, M. fortuitum and M. tuberculosis [7,8]. In combination with clofazimin, dapsone has been observed to be very effective against mycobacterium based disease such as leprosy. However, no reports are available till date using clofazimin and dapsone combination against M. tuberculosis. Combined effect of these drugs against tuberculosis possibly not as effective as in the case of leprosy. Major reason behind this ineffectiveness is their low aqueous solubility which leads to low systemic availability. Dapsone and clofazimine are categorized as a class II drugs according to the Biopharmaceutics Classification System, and have high permeability and low aqueous solubility. Sometime dapsone produces toxic metabolite as a result of first pass metabolism [9,10]. Thus, low aqueous solubility of clofazimine and restricted use of dapsone by oral route might limit their efficacy against TB . There is growing interest in the use of nano-carrier mediated drug delivery systems which are proved to show tremendous utility in the improvement of the efficacy of actives by virtue of improved solubility, absorption and distribution. Several types of nanocarriers have been tested against TB, like liposomes, niosome, solid lipid nanoparticle, microparticle, dendrimer, nanosuspension, nanoemulsion, microemulsion etc. [12,13]. These nanotechnologies offer several advantages over conventional delivery systems like target specific delivery, uniform distribution of the drug throughout the target site, improved solubility, sustained/controlled release etc. Luckily, nanoparticle shows higher constancy and carrier capacity when compared with other carriers. It has been enormously used to improve the drug bioavailability and site specific drug delivery . In the present investigation, we explored the utility of nano carrier in delivering dapsone and clofazimine simultaneously and in improving therapeutic efficacies against tuberculosis by modulating physicochemical properties (aqueous solubility, first pass metabolism) of dapsone and clofazimine. Nanoparticles are meant to ensure high availability of dapsone and clofazimine in to the systemic circulation. To explore the efficacy of dapsone and clofazimine combination in solution (DCS) as well as in nanoparticulate form, an In vivo study (against acute rat model of TB infection) were performed. Materials used were purchased in China only. Dapsone, Clofazimine, Chitosan, Poly(Lactide-co-Glycolide) (PLGA), Polyvinyl alcohol (PVA), vancomycin, phosphatidylinositol, cycloheximide, amphotericin B and pentasodiumtripolyphosphate (TPP) were from Sigma Aldrich. Dichloromethane and tween 80 were from Merck chemicals Pvt. Solvents and the chemicals used were of analytical grade. Milli-Q water was used throughout the study. Mycobacterium tuberculosis H37Rv (ATCC 27294) strain was kindly gifted from the National Tuberculosis Reference Laboratory (Beijing, China). A known concentration (10 μg/ml) of Dapsone and clofazimine in ethanol was scanned separately between 200 and 800 nm using UV-visible spectrophotometer (Shimadzu, Kyoto, Japan). The absorption maxima in the case of dapsone and Clofazimine were found to be at 295 and 495 nm respectively. Consequently, the stock of 1 mg/ml solution of dapsone and clofazimine were prepared in ethanol. Various dilutions of dapsone and clofazimine were prepared in the concentration range of 2-20 μg/ml. Absorbance of the dilutions was taken at their respective absorption maxima and the calibration curves were plotted  between absorbance and concentration. Nanoparticles (NPS) of dapsone and clofazimine were prepared as per the procedure reported elsewhere by Shah et al. using emulsion solvent evaporation method with modification. Briefly, Poly(Lactide-co-Glycolide) (PLGA) solution was prepared in dichloromethane and was mixed in 0.1% w/v PVA solution (20 ml), containing 0.5% w/v chitosan solution (4 ml) and 1.5 ml tween 80 with stirring which resulted the coarse emulsion. Coarse emulsion was homogenized at 20,000 rpm using high speed homogenizer (IKA, T25 digital, Ultra Turrax, Germany) for 10 min. The organic phase was evaporated. The nanoparticles dispersion was transferred to the vial and outer chitosan layer was cross linked using 100 μl of 1% w/v TPP by stirring at 300 rpm for 2 h which led to the tiny NPS. To prepare Dapsone and clofazimine nanoparticles (DCNPS), dapsone and clofazimine were dissolved in ethanol along with phosphatidylinositol and added in to the organic phase of DCM and PLGA. Entrapment (%) of dapsone and clofazimine in DCNPS was determined by weighing its fixed quantity in a volumetric flask followed by extracting in methanol. Samples were sonicated for 2 min to break the undissolved particles and aliquot of the extracted DCNPS was filtered using 0.45 μm PTFE filters. Content of dapsone and clofazimine inside the samples was quantified using their standard curve equation developed by UV-Vis spectrophotometer. Particle size and zeta potential of DCNPS were determined by dynamic light scattering method using Malvern zetasizer, U. K.). Internal morphology along with the dimension of the developed NPS was confirmed using transmission electron microscopy (TEM; JEOL, Tokyo, Japan) . To investigate the amount of Dapsone and clofazimine release from DCS and DCNPS, In vitro drug release study was carried out as per the procedure reported by Rai et al. with modification. Briefly, a dialysis membrane of 12,000-14,000 Da MWCO (Sigma-Aldrich Co, MO) was fixed between donor and receiver compartments of Franz diffusion cells. Cell was maintained at 37 ± 0.5°C using a circulating water bath. Accurately weighed quantity of DCS and DCNPS (equivalent to 2 mg of 1:1 Dapsone and Clofazimine ratio) were placed on dialysis membrane fixed in a donor compartment. The receiver compartment was filled with 2% v/v DMSO in PBS (pH 7.4). About 0.5 ml sample was withdrawn at predetermined time interval (0.5, 1, 2, 3, 4, 6, 8, 10, 12 and 24 h) and the receptor compartment was replaced with 0.5 ml fresh buffer. The samples were quantified for drug by UV-Vis spectrophotometer . In vitro cytotoxicity study of DCS and DCNPS was performed on peritoneal macrophages of mice using 3-(4,5- dimethylthiazol-2-yl)-2,5-diphenyltetrazolium (MTT) assay at various concentration (1.75, 4.5, 9.0, 18.0, 27.0 and 56.0 mg/ml) of dapsone and clofazimine in both DCS and DCNPS as per the procedure reported by Nazir et al. . Female adult Sprague-Dawley rats (220-250 g) were procured from the Slac Laboratory Animal Co., Ltd. Shanghai and housed in a 12 h day and 12 h night environment at room temperature. Mice were acclimatized in the animal facilities laboratory for 1 week before commencing the experiment. In vivo anti-tubercular activity was carried out in accordance with the guidelines of care and use of rats Institutional Animal Experimentation Ethics Committee (AEEC), Sixth People's Hospital of Zhengzhou, China for Animal Care and Use. In vivo potential of DCS (solution containing 1:1 ratio of dapsone and clofazimine) and DCNPS in an acute model of TB infection was evaluated as per the procedure given by Verma et al. . Female pathogen-free inbred Sprague-dawley rats were infected with M. tuberculosis H37Rv strain in an aerosol chamber and randomly divided into six groups of 6 each. First group was assigned as control group which was kept untreated while second group was assigned as standard control group and treated with isoniazid and rifabutin (INH-RFB) 10 mg/kg each. Rest of the groups served as test control and administered intravenously with DCS translating weekly dose of 100 and 200 mg/kgBW of dapsone and clofazimine and DCNPS translating weekly dose of 100 and 200 mg/kgBW of dapsone and clofazimine. Treatment (5 times per week for 4 consecutive weeks) started after 21 days when every animal got infected. Use of DMSO as solvent did not modulate the potency of the drugs. Lungs of animals of each group were harvested after 48 days of the infection and homogenized in sterile Middle brook 7H10 medium separately. Samples were centrifuged at 8000 rpm for 10 min and the supernatant of 100 μl was inoculated neat at 1:100 and 1:1,000 dilutions onto Middle brook 7H10 agar plates supplemented with oleic acidalbumin- dextrose-catalase, 25 μg/ml cycloheximide, 10 μg/ml amphotericin B, and 5 μg/ml vancomycin. Plates were incubated at 37°C in a biochemical oxygen demand incubator and CFU was scored after 4 weeks. Data expressed as the mean ± SEM. P values <0.05 were considered statistically significant and for statistical analysis Student’s two-tailed t-test was performed. Very low aqueous solubility of clofazimine and restricted used of dapsone i.e. due to the production of toxic metabolites limit the use of clofazimine and dapsone combination against TB. However, higher biological half-life i.e. 30 h (dapsone) and 70 day (clofazimine) respectively suggested their proficient utility by systemic route of administration. As clofazimine is a potent anti-tubercular molecule, its use as second-line drug against tuberculosis is well documented. In the presence of dapsone, clofazimine shows synergistic effect against mycobacterium. In combination clofazimin and dapsone are reported to be very effective in the treatment of mycobacterium based disease like leprosy however against M. tuberculosis this combination was not that much effective. Ensuring their maximum availability in systemic circulation with improved solubility and dissolution could enhance their efficacy. Polymeric nanoparticle was hypothesized to help avail therapeutic concentration of dapsone and clofazimine in systemic circulation and as a result, therapeutic efficacy could be enhanced . Biodegradable, DCNPS showed various potential advantages over DCS systemic delivery such as better effectiveness and systemic availability. Entrapment of dapsone and clofazimine was found to be 72.7 ± 4.95% and 68.95 ± 3.26%, respectively in DCNPS. TEM study revealed spherical shape, nano-size particles with smooth surface (Figure 1). The zeta potential of DCNPS was found to be +27.4 mV which possibly because of the free amine groups of chitosan on the surface of nanoparticles. Average particle size of DCNPS was measured to be 132.3 ± 27.3 nm with a polydispersity index (PDI) 0.12 (Figure 2). Nanosize particulate delivery would help available both the drugs for engulfment by macrophages of lung. Positive charge over the surface could ensure its efficient interaction or penetration. Figure 1. TEM micrograph of the optimized nanoparticle (DCNPS) formulation. Figure 2. Characteristics of the developed DCNPS i.e. zeta potential and particle size. DCNPS showed controlled release of dapson and clofazimine in dissolution media. Release of dapsone and clofazimine from their solution was found to be instant. About 100% of dapsone and 97% of clofazimine release were observed in first 4 h of the study period from their drug solution however, only 36 and 30 % release of dapsone and clofazimine was observed in the same time period from DCNPSG. 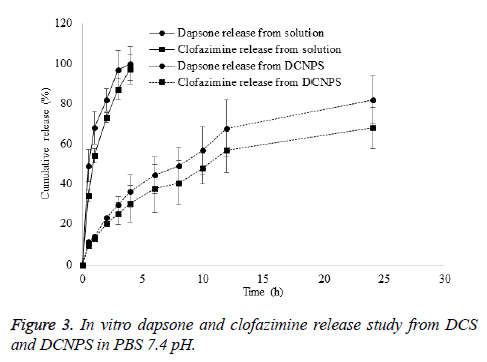 About 82 and 68% release of dapsone and clofazimine was observed from DCNPSG after 24 h (Figure 3). Sustained release of the drugs from DCNPS could be attributed to the diffusion of drug from the particles to the dissolution media. Controlled release of dapsone and clofaziminefrom the DCNPS is due to the dual release mechanism of chitosan and PLGA which ensures the availability of the drugs systemic circulation for prolonged period of time which may decrease the progression of bacterial growth . Figure 3. In vitro dapsone and clofazimine release study from DCS and DCNPS in PBS 7.4 pH. The MTT assay was carried out to determine the cytotoxicity of the dapsone and clofazimine NPS and solution in monocytederived macrophages. Results revealed no sign of cytotoxicity as the cell viability was found near to 100% in both DCS and DCNPS treated groups (Table 1). DCS and DCNPS have not shown any sign of toxicity at even higher dose. Instead, DCNPS avoided instant delivery of the drugs to the cellular media which might attribute to the sustained release and consistent diffusion of well-balanced quantity . Table 1. Cytotoxicity of the DCS and DCNPS in monocyte-derived macrophages after MTT assay. In DCS and DCNPS treated mice, dose-dependent alleviation of bacterial loads in lungs was observed when compared with diseased control group. However, DCNPS was observed to be more effective than that of the solution at the same dose of the drugs. Table 2, represents the Log10 no. of CFU/g of lung i.e. observed for each batch. DCNPS translating weekly dose of 200 mg/kgBW (1:1 dapsone and clofazimine) to rat showed equivalent efficacy as standard control group. Standard controlled rat showed efficient reduction in Log10 no. of CFU/g of lung as compared to that of DCS. Results have clearly proved that, sustained co-delivery of dapsone and clofazimine after bacterial infection could help in reducing the dose of the drugs [1,4]. Table 2. Numbers of CFU of M. tuberculosis recovered from lungs i.e. harvested after 4 weeks of treatment starting after 21 days of infection period. It is concluded that DCNPS is a suitable candidate for codelivery of dapsone and clofazimine to deep lung which demonstrates higher efficacy in preliminary In vivo experiments. Intravenous administration of DCNPS portrayed higher therapeutic availability of clofazimine than that of DCS. Comparatively higher therapeutic availability of clofazimine (less aqueous solubility) and dapsone (produces unwanted metabolite after first pass metabolism) in the case of DCNPS was attributed to the enhanced distribution and sustained release from positively charged chitosan stabilized PLGA nanoparticles. Therefore, DCNPS can be proved as a cost effective, safe, efficacious and clinically pertinent novel dosage form for the potential delivery of dapsone and clofazimine systemically. Niu NK, Yin JJ, Yang YX, Wang ZL, Zhou ZW, He ZX, Chen XW, Zhang X, Duan W, Yang T, Zhou SF. Novel targeting of PEGylated liposomes for codelivery of TGF-beta1 siRNA and four antitubercular drugs to human macrophages for the treatment of mycobacterial infection: a quantitative proteomic study. Drug Des Dev Ther 2015; 9: 4441-4470. World Health Organization. Global Tuberculosis Report 2014. Report No 9241564652. Geneva, Switzerland. World Health Organization 2015. Turner RD, Bothamley GH. Cough and the transmission of tuberculosis. J Infect Dis 2014. Xu J, Lu Y, Fu L, Zhu H, Wang B, Mdluli K, Upton AM, Jin H, Zheng M, Zhao W, Li P. In vitro and in vivo activity of clofazimine against Mycobacterium tuberculosis persisters. Int J Tuberc Lung Dis 2012; 16: 1119-1125. Tyagi S, Ammerman NC, Li SY, Adamson J, Converse PJ, Swanson RV, Almeida DV, Grosset JH. Clofazimine shortens the duration of the first-line treatment regimen for experimental chemotherapy of tuberculosis. Proc Natl Acad Sci 2015; 112: 869-874. Barr J. A short history of dapsone, or an alternative model of drug development. J Hist Med Allied Sci 2011; 66: 425-467. Gonzalez AH, Berlin OG, Bruckner DA. In-vitro activity of dapsone and two potentiators against Mycobacterium avium complex. J Antimicrob Chemother 1989; 24: 19-22. Opravil M, Pechere M, Lazzarin A, Heald A, Ruttimann S, Iten A, Furrer H, Oertle D, Praz G, Vuitton DA. Dapsone/pyrimethamine may prevent mycobacterial disease in immunosuppressed patients infected with the human immunodeficiency virus. Clin Infect Dis 1995; 20: 244-249. Peters K, Leitzke S, Diederichs JE, Borner K, Hahn H, Müller RH, Ehlers S. Preparation of a clofazimine nanosuspension for intravenous use and evaluation of its therapeutic efficacy in murine Mycobacterium avium infection. J Antimicrob Chemother 2000; 45: 77-83. Pochopin NL, Charman WN, Stella VJ. Amino acid derivatives of dapsone as water-soluble prodrugs. Int J Pharm 1995; 121: 157-167. Lindenberg M, Kopp S, Dressman JB. Classification of orally administered drugs on the World Health Organization Model list of Essential Medicines according to the biopharmaceutics classification system. Eur J Pharm Biopharm 2004; 58: 265-278. Choudhary S, Kusum Devi V. Potential of nanotechnology as a delivery platform against tuberculosis: current research review. ‎J Control Rel 2015; 202: 65-75. Kaur IP, Singh H. Nanostructured drug delivery for better management of tuberculosis. ‎J Control Rel 2014; 184: 36-50. Singh J, Garg T, Rath G, Goyal AK. Advances in nanotechnology-based carrier systems for targeted delivery of bioactive drug molecules with special emphasis on immunotherapy in drug resistant tuberculosis - a critical review. Drug Del 2015. Shah PP, Desai PR, Patel AR, Singh MS. Skin permeating nanogel for the cutaneous co-delivery of two anti-inflammatory drugs. Biomaterials 2012; 33: 1607-1617. Mishra N, Rai VK, Yadav KS, Sinha P, Kanaujia A, Chanda D, Jakhmola A, Saikia D, Yadav NP. Encapsulation of Mentha Oil in Chitosan Polymer Matrix Alleviates Skin Irritation. AAPS PharmSciTech 2016; 17: 482-492. Rai VK, Dwivedi H, Yadav NP, Chanotiya CS, Saraf SA. Solubility enhancement of miconazole nitrate: binary and ternary mixture approach. Drug Dev Ind Pharm 2014 ; 40: 1021-1029. Dubey A, Kabrawala H, Ghate V. Niosomal gel of Adapalene: Its formulation, physicochemical properties and evaluation for mild-acne. Adv Biomed Pharm 2014. Nazir S. Anti-tumor, Anti-oxidant and Anti-microbial potential of Nymphaea alba and Nymphaea mexicana flowers a comparative study. Adv Biomed Pharm 2015. Verma RK, Germishuizen WA, Motheo MP, Agrawal AK, Singh AK, Mohan M, Gupta P, Gupta UD, Cholo M, Anderson R, Fourie PB, Misra A. Inhaled microparticles containing clofazimine are efficacious in treatment of experimental tuberculosis in mice. Antimicrob Agents Chemother 2013; 57: 1050-1052. Salem II, Steffan G, Duzgunes N. Efficacy of clofazimine-modified cyclodextrin against Mycobacterium avium complex in human macrophages. Int J Pharm 2003; 260: 105-114. Rai VK, Yadav NP, Sinha P, Mishra N, Luqman S, Dwivedi H, Kymonil KM, Saraf SA. Development of cellulosic polymer based gel of novel ternary mixture of miconazole nitrate for buccal delivery. Carbohydr Polym 2014; 103: 126-133.